Topical medications are widely used as prescription or over the counter (OTC) treatments for a variety of conditions. Though, their use is common, there exists a significant confusion among the general public and some medically trained professionals, as to the difference between topical and transdermal products. While all topical and transdermal compounds are applied to the skin, only the transdermal formulations are designed to penetrate through the skin layer and exert their effects on deeper or more distant tissues. Transdermal products utilize several methods of enhancing penetration through the Stratum Corneum, the primary barrier of the skin, allowing sufficient amounts of the drug to either reach systemic circulation or deeper underlying tissues. Topical compounds only minimally penetrate the skin layer which is its designed intent. Utilizing the transdermal route affords site specific treatment, eliminating or minimizing issues with comorbidities, adverse drug reactions, drug/drug interaction, and side effects, resulting in GI, hepatic, renal, or other complications. Compounds have been applied to the skin for thousands of years to enhance beauty and treat local conditions. However, most topically applied compounds and/or drugs are poorly absorbed, if at all. This is due to the size and polarity of the drug molecule and the barrier effect of the skin. Many compounds are meant to remain on the skin surface (topical) such as sunscreens, insect repellents, and antiseptics while others penetrate into the skin layers (transdermal) to target sites within the skin or just below it. More recently, transdermal delivery technology has been developed to treat a range of conditions beyond the local site of application. Transdermal delivery can offer significant advantages over oral administration due to minimal first-pass metabolism, avoidance of the adverse gastrointestinal environment, and the ability to provide prolonged and controlled drug delivery. Examples include lidocaine, colchicine, scopolamine, estradiol and testosterone, nitroglycerine, and fentanyl. Despite these advantages, most active ingredients cannot be delivered transdermally due to their molecular size and structure. The terms topical and transdermal are often confused, used interchangeably, and poorly understood. This stems from the fact that all medications applied to the skin are topical by definition (applied to the top of the skin). However, the term topical medication generally refers to medications applied to the skin that rely on passive diffusion into the skin itself, creating a local effect. 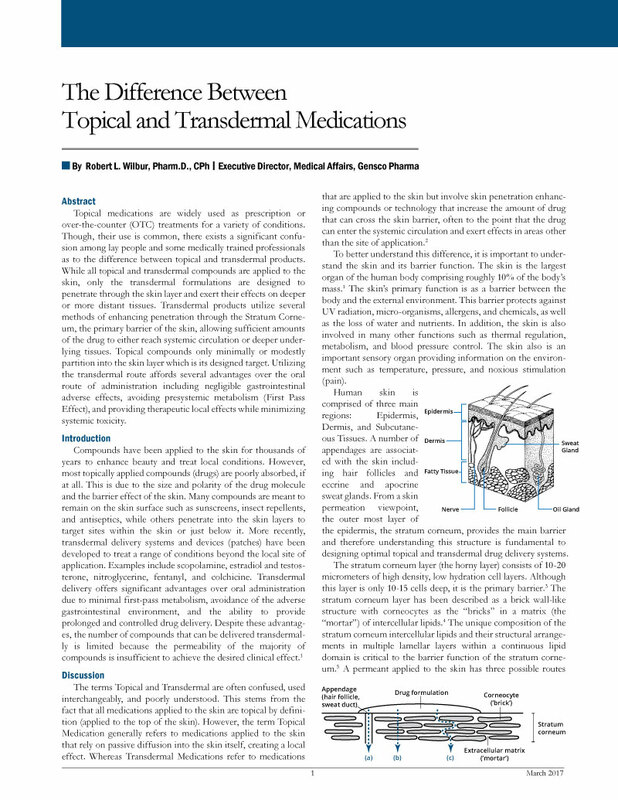 Whereas transdermal medications refer to medications that are applied to the skin but involve skin penetration enhancing compounds or technology that increase the amount of drug that can cross the skin barrier, often to the point that the drug can enter the systemic circulation and exert effects in areas other than the site of application. To better understand this difference, it is important to understand the skin and its barrier function. The skin is the largest organ of the human body comprising roughly 10% of the body’s mass. The primary function of the skin is as a barrier between the body and the external environment. This barrier protects against UV radiation, micro-organisms, allergens, and chemicals, and the loss of water and nutrients. In addition, the skin is also involved in many other functions such as thermal regulation, metabolism, and blood pressure control. The skin also is an important sensory organ providing information on the environment such as temperature, pressure, and noxious stimulation (pain). 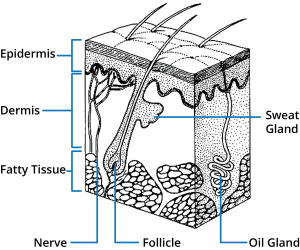 Human skin is comprised of three main regions; epidermis, dermis, and subcutaneous tissues. A number of appendages are associated with the skin including hair follicles and eccrine and apocrine sweat glands. From a skin permeation viewpoint, the outer most layer of the epidermis, the stratum corneum, provides the main barrier and therefore understanding this structure is fundamental to designing optimal topical and transdermal drug delivery systems. The stratum corneum layer (the horny layer) consists of 10-20 micrometers of high density, low hydration cell layers. Although this layer is only 10-15 cells deep, it is the primary barrier. The stratum corneum layer has been described as a brick wall-like structure with corneocytes as the “bricks” in a matrix (the “Mortar”) of intercellular lipids. The unique composition of the stratum corneum intercellular lipids and their structural arrangements in multiple lamellar layers within a continuous lipid domain is critical to the barrier function of the stratum corneum. A permeant applied to the skin has three possible routes across the epidermis: through the appendages (a), through the corneocytes (b – transcellular route), and through the matrix layers (c – intercellular route). These pathways are not mutually exclusive, with most compounds permeating the skin through a combination of pathways based on the physiochemical properties of the permeating molecule. While the intercellular lipid bilayers occupy only a small area of the stratum corneum, they provide the only continuous path through the stratum corneum. Many years of research have demonstrated the significance and importance of this route for drug permeation through the stratum corneum. Both lipid and polar molecules are able to be transported through this intercellular route but the amount and rate of diffusion are highly dependent upon the physiochemical properties of the permeant. The permeation process involves a series of processes starting with the release of the permeant (the drug) from the dosage form (vehicle), followed by the diffusion into and through the stratum corneum, then partitioning into the more aqueous epidermal environment and diffusion into deeper tissues or uptake by the cutaneous circulation. These processes are highly dependent on the solubility and diffusivity of the permeant within each environment. Due to this wide variability in permeability of various drug molecules, several strategies have been developed to facilitate drug permeation through the epidermis. Physical enhancement methods (micro needles, sonophoresis, iontophoresis, micro abrasions) are not pertinent to this discussion as they actively disrupt the skin structure. Passive diffusion enhancement can be achieved by two primary methods: Increasing the thermodynamic activity of the drug in formulations (supersaturations), and use of chemical penetration enhancers (CPEs) that interact with skin constituents to promote drug flux. While supersaturation is still in the experimental phase, CPEs have been widely used for decades. CPEs are pharmacologically inactive compounds that diffuse and partition the skin and reversibly interact with the stratum corneum components, specifically the intercellular lipid bilayers. Substances that perturb the highly ordered arrangements of the intercellular lipid bilayers are likely to reduce the diffusional resistance of the stratum corneum to most drug molecules. The effect is the development of pore or channels in the lipid bilayers through which the drug molecules can pass. There are hundreds of CPE substances available for formulation of a drug delivery vehicle, the selection of which is based on the permeant molecule’s physiochemical properties, manner of application, and risk of skin damage. The proper selection and formulation of one or more CPEs with a specific drug can increase the transdermal absorption of the drug from 1-5% of drug applied, as seen with topical application with no CPE, to rates greater than 40%. The enhancement of drug crossing the skin, flux, allows for deeper tissue penetration of the drug and uptake by the cutaneous circulation providing for systemic activity. To date, most transdermal delivery systems for pharmaceuticals have been patches. Patches, by themselves, do not enhance the ability of drug molecules to permeate the skin but can increase drug absorption due to prolonged application times. The formulation matrix of the patch, or reservoir, maintains the drug concentration gradient within the device after application so that drug delivery to the interface between the patch and the skin is sustained. The high drug concentration and occlusive nature of the patch can drive modest amounts of drug through the skin over time, though most of the drug applied remains in the patch. On-going advances in the development of CPE compounds and technology, such as nanoparticle delivery systems, including micelles, are opening the transdermal route of administration to new and old drugs alike. Micelles are lipid molecules that arrange themselves in a spherical form in aqueous solutions. The formation of a micelle is a response to the amphipathic nature of fatty acids, meaning that they contain both hydrophilic regions (polar head groups) as well as hydrophobic regions (the long hydrophobic chain). Micelles contain polar head groups that usually form the outside as the surface of micelles. They face to the water because they are polar. The hydrophobic tails are inside and away from the water since they are nonpolar. Micelles can sequester lipophilic drug molecules within the sphere and allow for the movement of these molecules through polar environments. The transdermal system created by Gensco Pharma utilizes a micelle forming vehicle that encapsulates the drug and combines with CPEs to further increase the amount and rate of permeation. The increased flux allows for a greater amount of the permeant to move across the skin barrier faster and be available to the deeper tissues and cutaneous circulation than typical patch systems. Medications that are effective for specific conditions but were limited in use due to adverse gastrointestinal effects, high first pass metabolism, and poor bioavailability are now being evaluated for transdermal administration. Controlled and sustained drug delivery through nanoparticle design and by use of the skin as a drug reservoir is revolutionizing the way we look at transdermal drug administration. We can now truly say we have skin in the drug game. Continuing advances in skin penetration enhancement are allowing new and old drugs to be administered transdermally, providing prolonged therapeutic effects and improved patient safety. Understanding the formulation and penetration differences between topical and transdermal medications is crucial to selecting the appropriate product for a specific use. Medications that are intended to exert clinical effects at distant or deeper tissue sites require a purpose-designed transdermal vehicle. These vehicles (gels, patches, films, etc.) often include one or more chemical penetration enhancers to increase transdermal penetration to achieve the desired outcome. However, the clinician should be aware not all patches or topical gels are transdermal. Most creams, gels, ointments and patches are merely topical formulations with limited, if any, drug penetration to the tissues and circulation below the skin. Understanding the differences between transdermal medications (LiDORx, ColciGel, SpeedGel, Trans-Scop, Androgel, etc.) and topical preparations (Lidocaine patches, creams, steroid creams, fungal creams, antibiotics, and most OTC topical products) will allow for the proper selection of the best option for the patient.